A French Cold War nuclear bomber has begun a four-day journey to its new home at an English air museum. 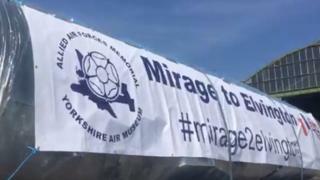 The 31-tonne Dassault Mirage IVA has been donated to the Yorkshire Air Museum, at Elvington near York, by the French government. It is the only Mirage IV aircraft to be given to an independent museum and the only one outside France. The 77ft-long (23m) plane is travelling 527 miles (848km) by road and sea and is due to arrive on 30 March. The Mirage IV was built as part of France's independent nuclear deterrent during the Cold War. Around 60 were built and entered service in 1964 and subsequently served as conventional strike and reconnaissance aircraft during conflicts including the Gulf War and Afghanistan. It was retired from service in 2005. Negotiations to bring the aircraft to Elvington began in 2007, but the formal announcement of the gift was not made until August 2016. The Yorkshire Air Museum has strong links with France as during the Second World War two French bomber squadrons were based at the then RAF Elvington. The plane, which was previously displayed at the Cité des Sciences et de l'Industrie in Paris, was loaded in parts on to lorries at Chateaudun Air Base near Paris on Monday. It will travel across France and then sail from St Malo to Portsmouth before travelling by road to York. The museum said the aircraft would be reconstructed and a formal presentation event would be held later in the year.